A wee update, Bayhead being reseeded so we will be using Stornoway Primary School for the Sixes this Saturday. All players please be at the park for 2pm at the latest, bring shorts and socks, we will be showering down at Smith Avenue. Looking forward to welcoming Kincraig Camanachd to the island as we pay tribute to Craig. Come down and watch the action from 2.30pm. Thanks to the many fans who braved the rain and cheered on a great performance from na Leòdhasaich on Saturday as we defeated Strathspey 5-3. Despite trailing 2-1 at halftime, goals from Will, Tyson and a first ever Lewis hat-trick from Duncan saw a first win of the season at Shawbost. Plenty of cracking shots from Coinneach herebut the above shot sums up the Lewis spirit, through adversity, through defeat, through the rain, all worth it for days like Saturday. Training this week and the sixes Saturday. Tha Camanachd Leòdhais toilichte a bhith a’ cumail Campa Iomain an t-Samhraidh air Pàirc Gach Sìde Barraid Mhic a’ Ghobhainn air seachdain an Fhèis Cheiltich Innse Gall mar phàirt den sgeama Motiv8 aig Comhairle nan Eilean Siar. Tha iomain air a bhith na pàirt mhòr den Fhèis o 2007 agus bidh an gèam mòr gach Disàthairne eadar Leòdhas agus Uibhist aig Ceann a’ Bhàigh a’ tarraing nan ceudan. Am-bliadhna, bidh an cothrom aig an òigridh eadar 8-16 pàirt a ghabhail san spòrs Ghàidhealach eachdraidheil seo le seiseanan còidsidh air Diciadain 17, Diardaoin 18 agus Dihaoine 19 den Iuchar. Bidh an campa dà-chànanach eadar Gàidhlig agus Beurla ach tha e fosgailte dhan a h-uile dhuine. Thèid ùidheamachd leithid de chlogadan is camain a chumail ris a’ chloinn a ghabhas pàirt ach ma tha stuth aca mu thràth, tha iad làn dì-bheathte sin a thoirt leotha. Tha Camanachd Leòdhais airson taing a thoirt do Chomhairle nan Eilean agus Fèis Cheilteach Innse Gall airson an taic a bhios iad a’ cur ri iomain sna h-Eileanan an Iar. Cuir fòn gu 01851 822 800/785/757 airson àite a ghlèidheadh. Camanachd Leòdhais are delighted to be holding Summer Shinty Camps on Smith Avenue Astroturf during the week of the Hebridean Celtic Festival as part of Comhairle nan Eilean Siar’s Motiv8 programme. 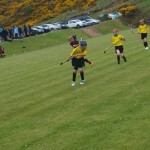 Shinty has been a big part of the Festival since 2007 and the big cup match every Festival Saturday between Lewis and Uist attracts hundreds to Bayhead. This year, youngsters between 8-16 will get the chance to take part in this historic Gaelic sport with coaching sessions on Wednesday 17, Thursday 18 and Friday 19 July. The camps will be bilingual in Gaelic and English but they are open to all. Equipment such as sticks and helmets will be provided but if children already have their own equipment they should feel free to bring this. Children should bring shinguards, suitable sporting footwear for astroturf and a packed lunch. Camanachd Leòdhais would like to thank Comhairle nan Eilean Siar and Hebridean Celtic Festival for their support for shinty in the Western Isles. Phone 01851 822 800/785/757 to book a place. Lewis 0 – Lochcarron 3, Crawford News! 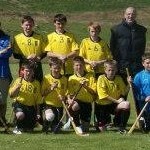 We can be proud of the boys despite a 3-nil defeat to Lochcarron. Yet again a good team performance with lads fighting for one another against top quality opposition. The roar from the Lochcarron boys when Ross Brown scored his first on the hour mark, and indeed the sound they made when the full time whistle went showed how much they valued that win and how much they were made to work for it. Always a pleasure to welcome na Carrannaich to Lewis and best of luck to them for the rest of the season. Congratulations to Crawford who was away representing the Scots Army team in the Bullough Cup V Col-Glen. Crawford played at half-forward and after extra-time the scores were tied 1-1. The soldiers won on penalties and now face Kyles in the semis. Well done Mr Maclellan! Please ensure you get to training this week, both Tuesday and Thursday. Fitness work on Tuesday, please being boots and trainers. Stick work on Thursday. We have a home game against Strathspey this Saturday. 2.30pm at Shawbost. Get along tomorrow to support the Dubh is Gorm, this is gonna be a real challenge against a Lochcarron side who have really recovered their mojo since a rocky start to the season. The boys always go onto the park believing we can get the result and after a point in Battery Park in March we can go into the game with our heads held high. Come along! A long journey, some beautiful weather, Ally MacKenzie in hospital, a night out in Inverness, usual. Unfortunately we did our usual against Lochaber, and after a promising first ten we gave away some cheap goals, then rallied in the second half, but still lost a couple of goals to penalties. Frankly lochaber were a cracking young team and deserved their win with some tremendous play by young players but there were aspects of our own performance that were promising as well. Lochaber also showed us great hospitality and we look forward to welcoming them to Shawbost in July. Vital that players get themselves to training, games are going to be coming thick and fast the next two months, so get along and stay fit! 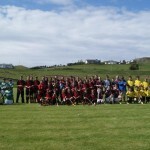 After a hiatus last year, the Craig Morrison Stornoway Sixes will be held on 29th June in Stornoway, Isle of Lewis. 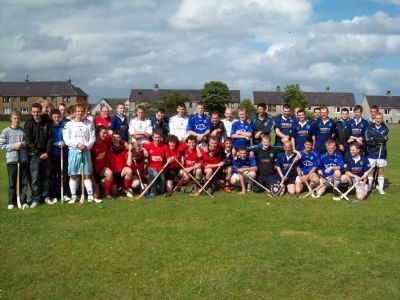 The whole West Coast Shinty Fraternity was in attendance. Skye Camanachd A&B, Lochcarron and a combined Uist/Lochbroom/Kinlochshiel Side known as Stromeferry No Ferry United competed in that tournament, with Skye Camanachd “A” winning a thrilling final against Lochcarron and Craig’s friend, Scott Murray of Lewis winning player of the tournament, the picture above has Scott being presented with his award by Craig’s father. It was a fitting memorial for a young man who was a positive and proactive member of the club in its early non-league days. The 2011 version was played between local teams and was won by the Lewis B Team, but unfortunately there was no time to schedule the tournament last year. The 2013 tournament is open to allcomers and the club would be interested in hearing from all and any teams who wish to participate for this prestigious trophy. A great weekend is guaranteed in Stornoway at the height of the summer and it is well worth the trip. The Tournament will begin at 1pm, but mainland sides will be able to start play at 2pm to allow them to come off the ferry from Ullapool, or to reach Stornoway from Tarbert. Turas eile a Loch Abair airson nan Leòdhasach. It’s another long trip, and for the Lewis based players, another overnighter for our maiden visit to Spean Bridge and a fixture against Lochaber. In terms of history, Paddy played here last year for Skye & Wester Ross U17 and Donald faced Lochaber in a winner takes all shootout for North Three whilst at the Uni. Apart from that it’s a nice new adventure and one we’re looking forward to. Far North Sixes 2013 – A Decent Third! 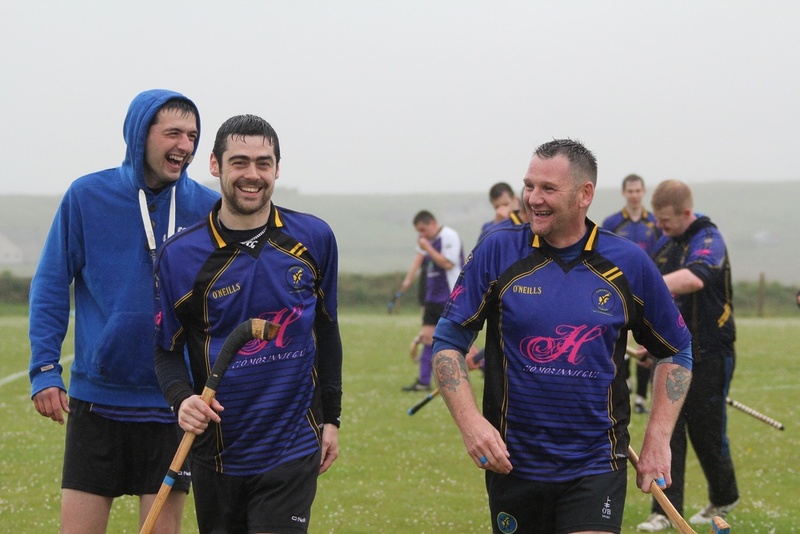 On Saturday 1 June, Lewis Camanachd sent a youth team to the mainland for the first time in far too long, the destination, Scourie and the Far North Sixes. 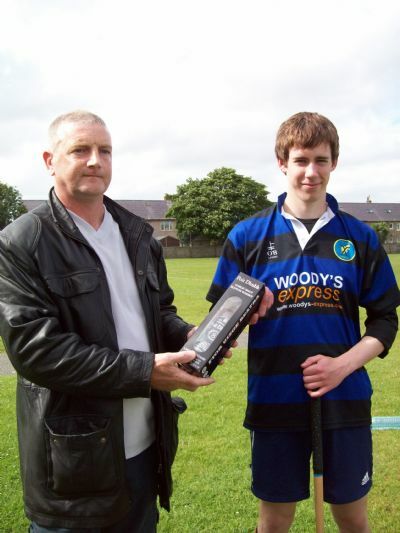 The games were held on the football pitch at Scourie where in 2010, Lewis Camanachd B had won the open competition. This compeition always has good weather it seems and the eight U-14 youngsters, accompanied by Mr Sinclair and Mr Nally were looking forward to competitive action. 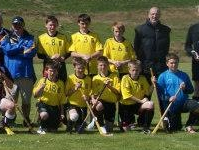 They had a baptism of fire against eventual winners Beauly, who regularly compete in competiitons such as the MacMaster Cup, and Mr Sinclair was certainly of the opinion that this team could have had a chance of winning the open competition, which was won by Kinlochbervie. Beauly ran out 10-0 winners but Seumas MacRae in goals had a great game for Lewis and keeping the score down against a’ Mhanachainn’s classy one touch play. Next up was a game against Kinlochbervie A . Lewis performed much better in this game despite losing 4-0 against an experienced side, and there was a notable performance by Scott Macleod in defence. 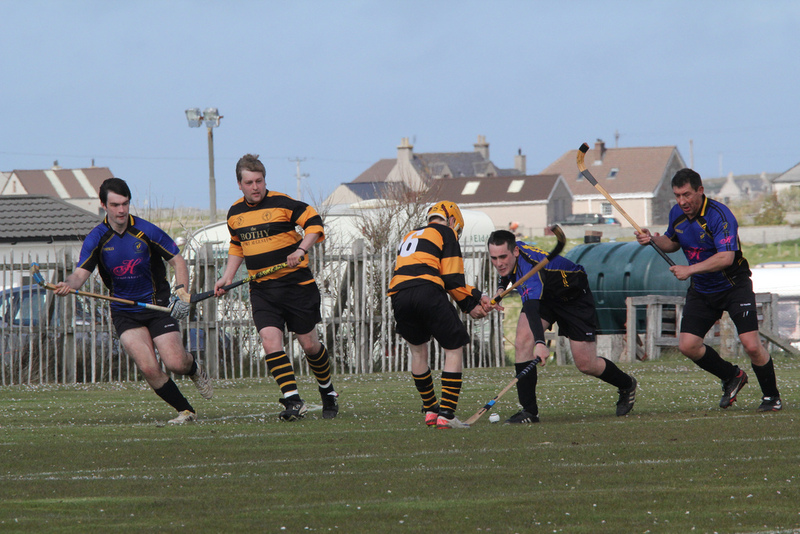 Top scorers for the Leodhasaich were captain Ronan Sinclair with 8 and Craig MacLeod with 6. Lewis finished third in the league of 5 teams. The team look forward to further competitive games in the near future. Technically Ronan’s 8 goals places him ahead of Will in the scoring charts 😉 We look forward to the youngsters making the step up to the senior team in the near future also. Below are a couple of photos of the guys in their smart yellow strip. Season so far has been the story of just falling short and perhaps learning to close out games is something that will take just a little more time. We can be proud of the lads who played on Saturday in what was a sterling first half performance followed by a real battle in the second half which eventually saw the Inverness-shire side take the spoils 2-0. Boleskine are a side who possess the ability to create something from nothing and it was last year’s Marine Harvest Player of the Year, Lewis Smith, whose two goals were both excellent efforts, that was the difference yet again. Conor did well to do a double save of a penalty in the first half and there are a lot of positives to take from the game, including players such as Gomez getting a full 90 minutes under his belt. A full report plus pictures from the Far North Sixes to follow as well. As this was the youngsters first foray onto the mainland it was understandable that they would face tough opposition, they received a 10-nil beating from a very strong Beauly side, picked it up against KLB A, only going down 4-0, then won 9-nil and 10-nil against KLB B & C. Many of the players will still be Under-14 next year and things are looking good for the future and they will hopefully improve on their 3rd place next year.